Big rallies in gold and silver on Friday added excitement to the bullishness that has defined price action in the precious metals for the past two months. Because they are priced in dollars, both metals tend to do better in a weak-dollar environment. The weaker the greenback, the more it takes to purchase an ounce of gold or silver. The precious metals have rallied while the dollar has done nothing more than chop sideways. This is positive. Gold has been the stronger metal up to now. However, history tells us that silver will catch and eventually surpass gold on a relative basis, when and if a full-blown precious metal bull market develops. This will not occur until the Midas metal can close convincingly above big resistance at $1,392 per ounce – the high of gold’s 5-year trading range. Our near-term upside targets for gold are $1,325 and $1,407 per ounce. Our long-term targets are $1,500 and possibly $1,700 per ounce, if gold can break out to the upside and hold above $1,400. RMB Group trading customers who followed our suggestion to purchase COMEX December 2019 $1,400 / $1,450 bull spreads using the COMEX options for $600 or less should consider holding their positions. These spreads were going for $930 apiece as of Friday’s close. Like gold, silver negated its downtrend in early December. Our near-term upside targets are $16.75 and $18.50, with a potential of $19.50 and $21.50 per ounce over the long term. Friday’s 45-cent reversal rally in silver was some of the best price action we’ve seen in a while. We still believe silver is a bargain even at these levels. This is especially true if the rallies in gold and its more expensive cousin, palladium, continue. Visit us at RMB Group to learn more about establishing limited risk long positions in gold and silver. RMB Group trading customers who were able to purchase the December 2019 $18.00 / $21.00 bull calls spreads we suggested buying for $900 or less when silver was testing old lows in September should consider holding on. These spreads finished at $1,650 as of Friday’s close. At the same time, holders of the March 2019 $16.00 call / $13.50 put “strangles” we suggested purchasing for $800 or less in December have a big decision to make. With only 31 days left until option expiration, these options are on the steep, slippery portion of the time decay curve. Friday’s price action took the $16.00 call leg of this strangle from deep “in the red” to “in the black” in a matter of hours. Is this a gift horse or a harbinger of something bigger and better? We should know fairly quickly. The percentage play would be to exit the March $16 call and choose another bullish strategy. However, doing that could leave a lot of money on the table should silver’s Friday explosion extend into this week. It’s a tough call but, suffice it to say, 31 days is not a lot of time. Please be advised that you need a futures account to trade the markets in this post. 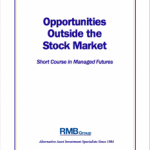 The RMB Group has been helping its clientele trade futures and options since 1984 and are very familiar with all kinds of option strategies. Call us toll-free at 800-345-7026 or 312-373-4970 (direct) for more information and/or to open a trading account. Or visit our website at www.rmbgroup.com. Gold Hits $1,325. Will $1,407 Be Next? Learn the story of successful entrepreneur and alternative investment specialist, Barry Potekin. Research our database of managed futures programs, create watchlists and create hypothetical portfolios.